This article is about the minigame from Mario Party 7. For the Gaddget from Mario Party Advance, see Dart Attack (Gaddget). 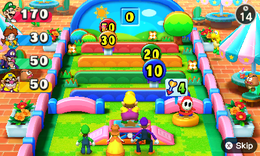 Dart Attack is a 4-player Mic minigame from Mario Party 7, and it returns in Mario Party: The Top 100. 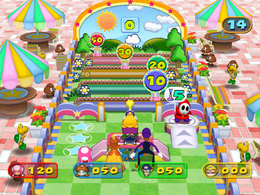 A Shy Guy walks through a gate and into the playing area, followed by the four players. The first player steps up to the central pedestal. The players must gain as many points as possible by shooting darts at the targets worth 10, 20, 30, and 50 points. If the dart goes past all four targets, no points are awarded. Each player has five darts to shoot. The player can get up to 250 points. The winning player(s) do(es) their victory animation; in Mario Party 7, Shy Guy cheers them. Rules – "Say "fire" to blow a dart at the moving targets. You can launch up to 5 darts." Advice – "Don't spend too much time aiming, or the game will end with darts unspent!" Description – "Blow into the mic to fire a blowgun dart at the moving targets! You get 5 chances!" On-screen – "Hit the targets with blowgun darts!" The minigame's name is a play on the words "heart attack". This page was last edited on August 4, 2018, at 07:50.